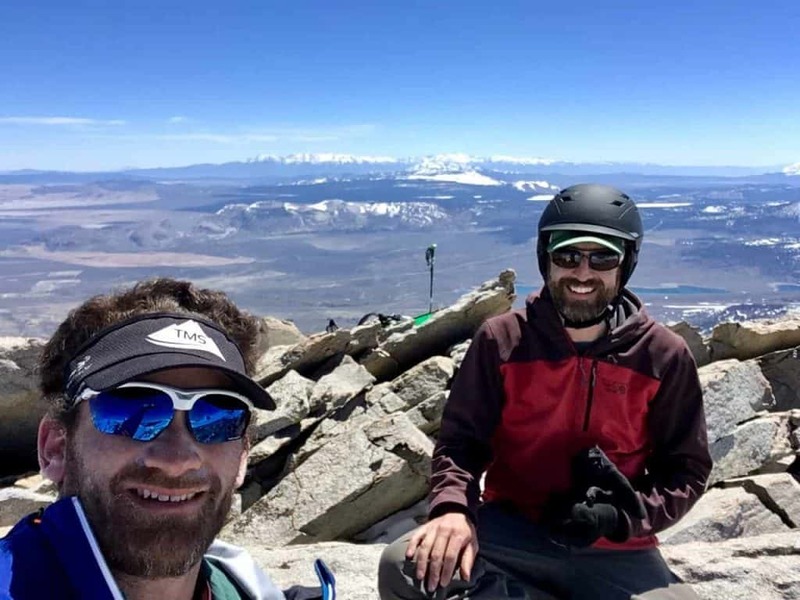 The summit of Mt Gibbs is awesome! 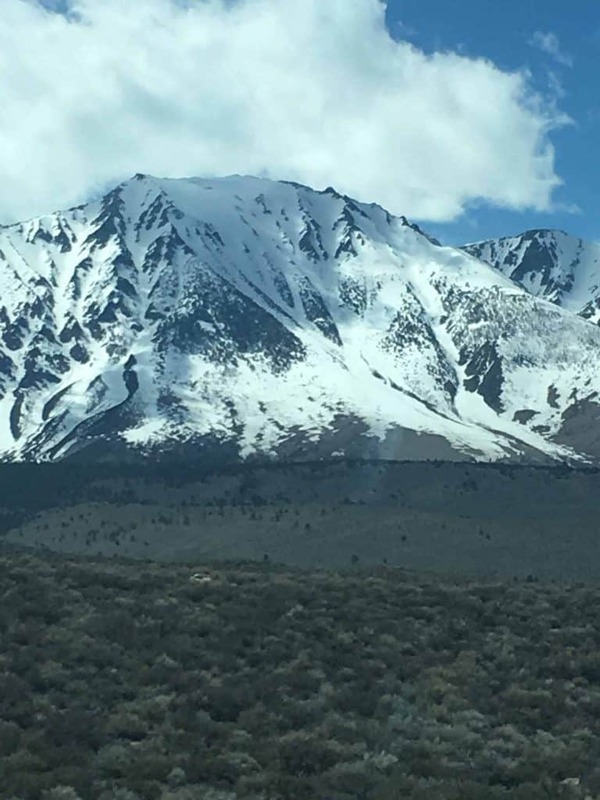 View from highway 395 driving north. Mt. 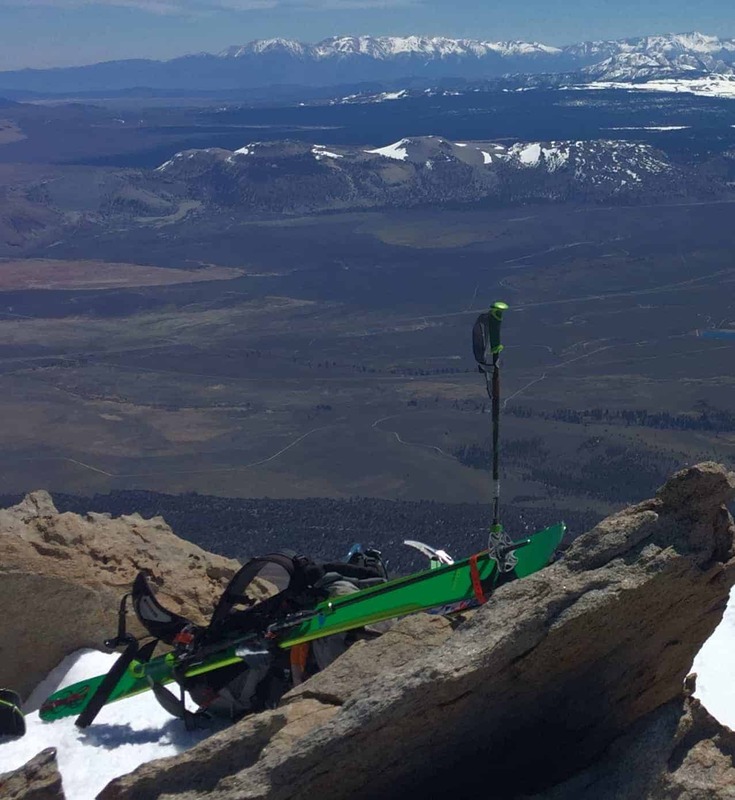 Gibbs is on the tick list for anybody who drives Highway 395 and likes to backcountry ski and/or climb mountains. 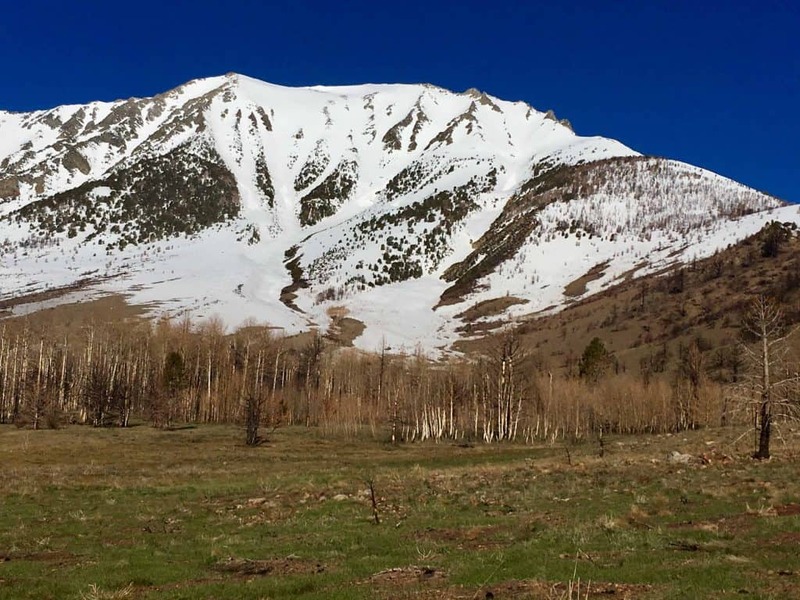 It’s one of the Big 3 that line the famous highway in the June Lake area of Eastern California. Luckily, this was my time to tag the summit and rip amazing turns all the way down this gorgeous mountain! 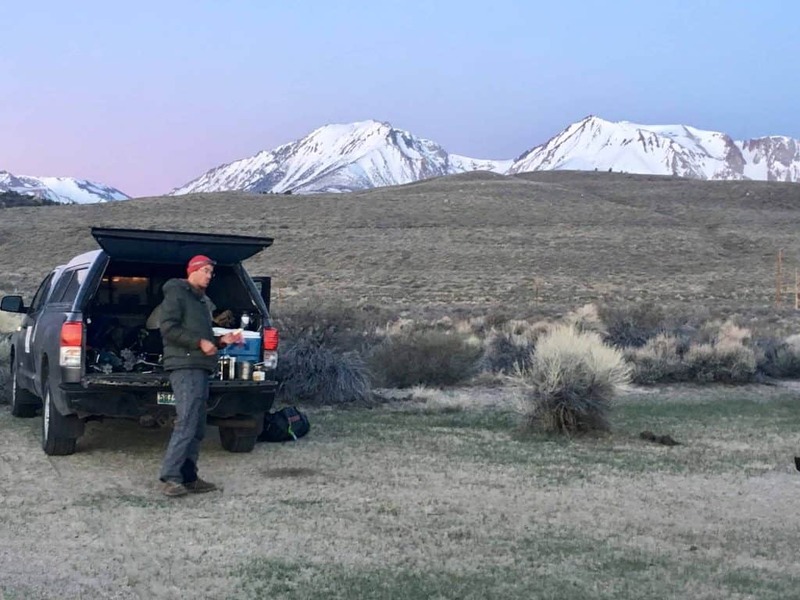 Here is my story with beta….and for all of you saying…”he’s giving away all the beta”, you shouldn’t worry because it’s all right here in this famous book (Backcountry Skiing CA’s Eastern Sierra), or you can simply stare out your car window as you travel down the highway. (The aforementioned famous guidebook, there is also an app to go along with it. 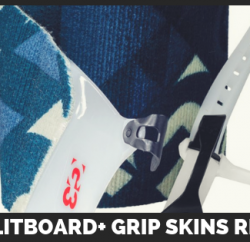 Check out Rakkup here. Mt. Gibbs is the peak on the left, greeting us upon sunrise since we pulled in while it was dark. This is from our side of the road desert campground on the east side of 395, south of Lee Vining. Start Time/Elevation: 7:15 am/7,300 ft. Dirt Walking/Bushwacking: About 1 hour. By staying high on the north side of the main drainage/meadow, you can avoid the burnt forest of Aspens and Pines and extreme log hopping. 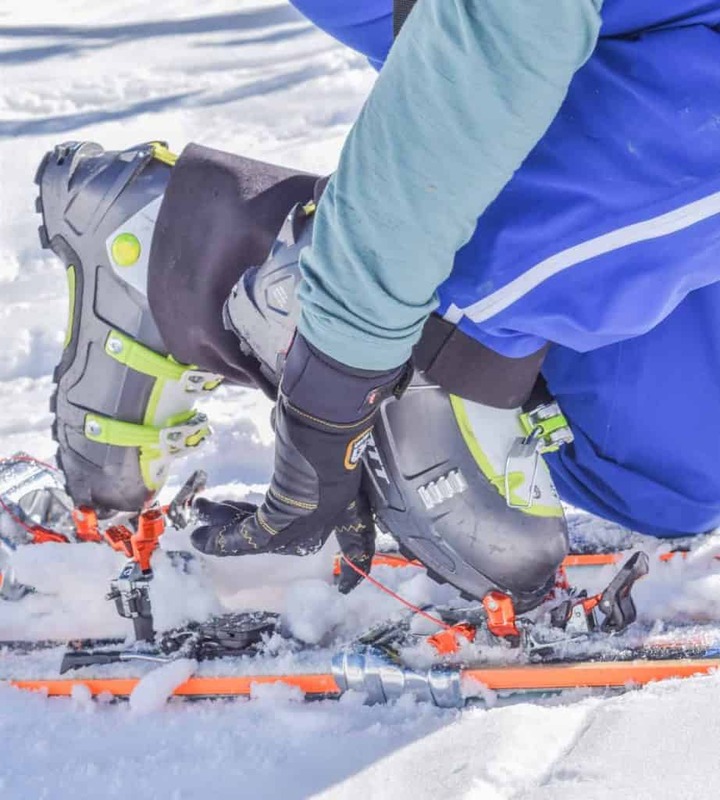 Once we got to the snow, within about 500 ft. we could see a skin track and boot pack already existing from what looked like a group of 4 that were there the day before and then 2 folks who started about an hour before us. We used skins, then ski crampons and then crampons and ice axe/whippet for the final push through the steeper part. We took an up line on looker’s left of the main, straight gulley. 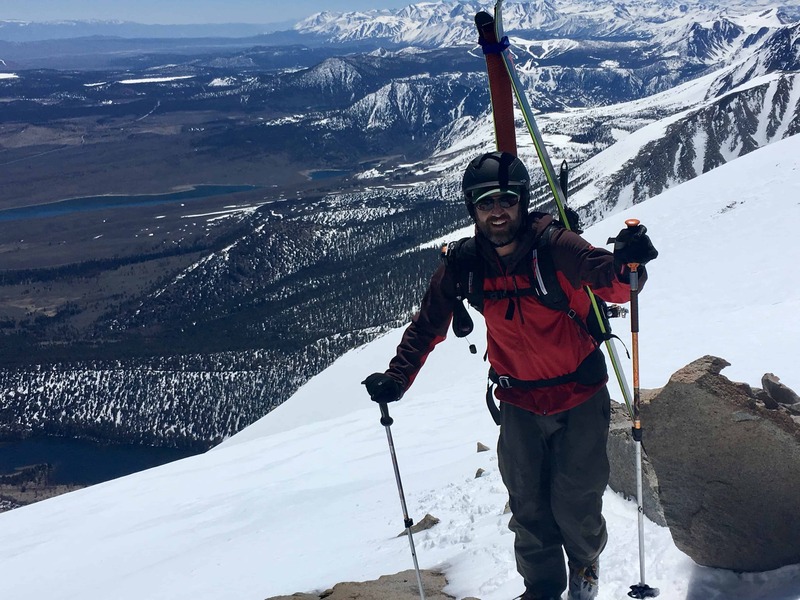 For this trip, it was the core group of my skier buds and our tight bond in the mountains made for easy communication and smooth travel throughout the day. 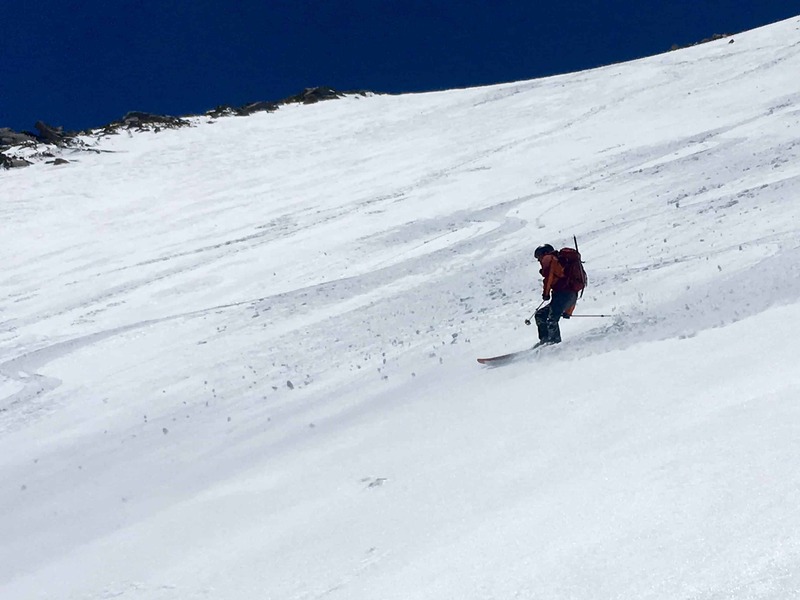 Once we reached the upper snowfield and summit ridge, we traversed to what’s known as the skiers summit of Gibbs. 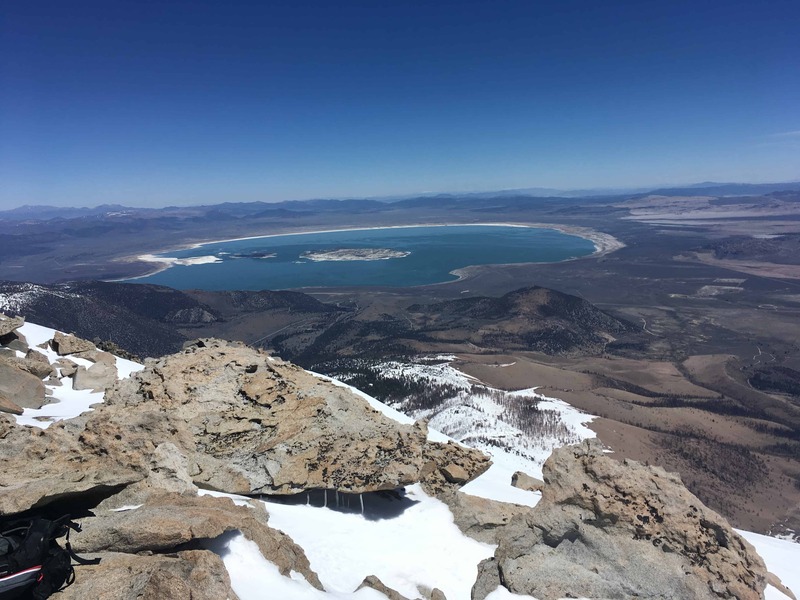 From pretty much everywhere on this mountain, you have insane views across to Mono Lake, the craters, June Lake and as far as the eye can see. Check out this pic of the Kidney Chute off of the Dana Plateau. 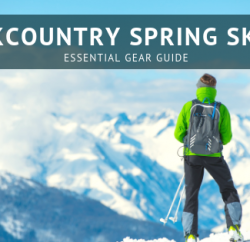 We all used a little different gear to reach the summit. We all reached the summit with surprising ease as the anticipation was that this was going to be a much more convoluted climb. I don’t have any pictures looking down the mountain, because the top is basically a giant snowfield with a convex rollover into the gullies below. You can only look down onto the upper snowfield and can’t see the gullies or the bottom of the mountain. This is prime avalanche terrain, be careful in this area. 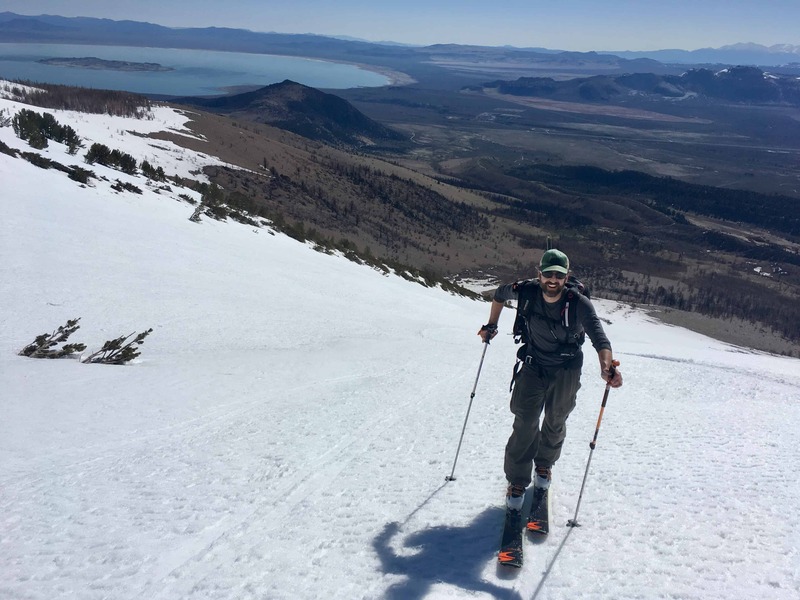 To start the descent, we took a few turns on the still frozen upper section and stopped just before the convexity. 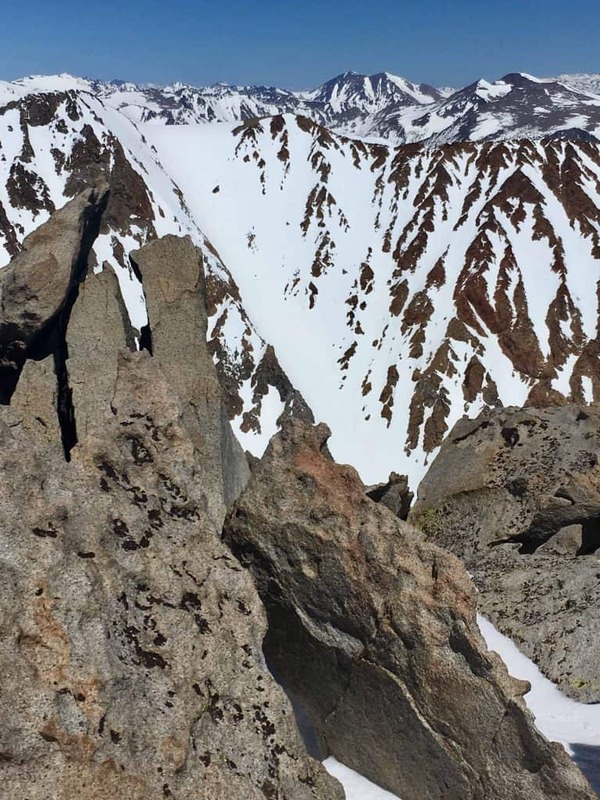 It’s funny, I hadn’t felt a bit of nervousness all day, but something about a rollover at 12,000 ft into a 40 degree gully will make you think twice. Well, it took about 2 turns for me to realize we NAILED IT! The snow had transitioned so perfectly and I was the first one down. Note of Caution: While it was perfect right there, we knew it was going to warm and get more dangerous as we proceeded so the plan was to ski through the crux and avoid any avalanche possibilities. With lots of wet slide debris at the bottom of all the gullies, we were aware of the warming that was taking place and the time of day. Before I took off, we talked about the fact that if it was good, I was going to keep going and take the straightest line off the top that I could. So I did. And…there are not many pics to prove it! Here is Zack making it look pretty off the top. 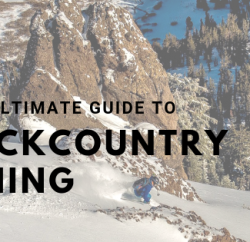 Get the Best Backcountry Skiing Guidebook For the Eastern Sierra Here!